I keep telling people that this is a zine about soda and karaoke, which is actually code for sobriety and learning how to build self-confidence. What began as a zine about my love of karaoke has turned into something more. In the summer of 2013, I went on tour with Bad Hex and Xtramedium, carting my distro along in a shoebox and doing zine readings at house shows, infoshops, and the occasional bar. I kept a tour diary and documented our way through the Pacific Northwest, the desert, the West Coast and back again. Included is writing on taking space from dudes at punk shows, fighting depression and self-hate, visiting Viretta Park at twenty-seven years old (next door to the last house that Kurt Cobain lived in), feminist boredom, how I built my self-confidence, and how road games turned the summer into a soda tour – I tasted 140 different kinds of soda! If you wanna talk about root beer, I’m your girl. 62 pages, mostly typewritten with some cut-and-paste details; a lovely piece by Kit (of Pinch Kid) on karaoke, friendship, and mental health; and a cover illustration by Giz (of Cheaptoys). What Lily Pepper has to say: “Oh man, I’m a really big fan of Amber’s writing, and I was so excited when I heard she’d be coming to the Zine-Off with a new zine, and even more so when I saw how long it is (61 pg. at quarter-letter size). It was a joy to sit and talk with Amber, who is a lovely, smart, kind person, and when I left Pressed, I couldn’t wait to get home and read her zine. Her writing just keeps getting better. In The Triumph of Our Tired Eyes #3, she writes about how she spent her summer on tour with some friends. Topics include reclaiming space for non-dudes at punk shows (so important), drinking 140 different types of soda, and her love of karaoke. 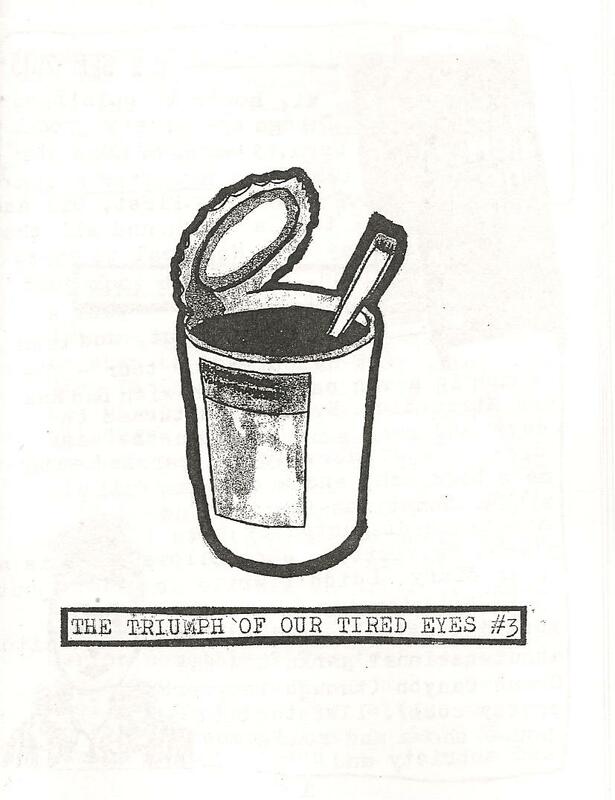 You can order it for $2.00 + postage from the Zines S-Z page, send me well-concealed cash and/or Canadian stamps and/or a mixtape in the mail, or if we know each other in real life, maybe buy me a coffee or a soda or something? Fight Boredom Distro News: There is so much going on! I’m still getting back into the swing of things after six weeks of traveling, plus I had the good fortune of visiting Ottawa last week and tabling at the Ottawa Zine-Off. I’ve added a bunch of new zines to the catalogue, including The Reverse Cougar Years #5, Sour Puss #8 / Fergus #30, Pansy #8, Doris #30, Contre l’Amour, Cheaptoys #13, Zine Crush #3, SCAM #6-#7, Tongueswell #1, and Finale 95 #1 and there are way more to come. Keep up to date by checking the News page from time to time, and come see me at the Toronto Queer Zine Fair on October 19th! ottawa loves you, come back soooon!